England manager Martin Johnson has demoted Wasps fly-half Danny Cipriani from the Elite Player Squad, with Jonny Wilkinson returning to the international fold in his place. Cipriani began last season's autumn internationals as England's first-choice fly-half, but after some high profile errors and speculation that he had a frosty relationship with Johnson due to his celebrity lifestyle he found himself out of favour. 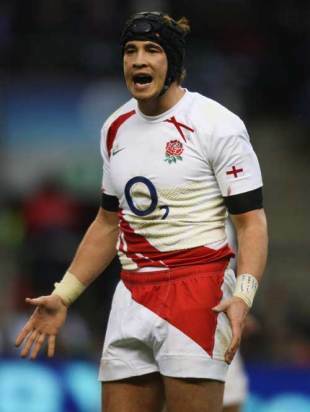 He was replaced by Brive's Andy Goode during the Six Nations, not featuring after dropping in to the Saxons squad. He was also overlooked for this summer's tour to Argentina, instead filling the Saxons' bench for the Churchill Cup final. Wilkinson's return to fitness with Toulon after a dislocated kneecap has seen him make an immediate comeback, having not featured for England since the 2008 Six Nations. Wilkinson, along with Brive-bound centre Riki Flutey, is retained despite agreeing a move to play in France next season but the story is different for James Haskell, Tom Palmer, Goode, Tom May, Jamie Noon and Steve Thompson. Having agreed to play in France's Top 14, these players have been left out of both squads although Johnson maintained that they were still in the thoughts of selectors. Bath wing Matt Banahan has been rewarded for an excellent first Test series against Argentina this summer with a place in the full squad, where he is joined by fellow summer debutant David Wilson. At the other end of the scale there is a recall for veteran centre Mike Tindall, with Julian White, Ben Kay and Simon Shaw all providing experienced heads. Leicester flanker Lewis Moody has been forced to make do with a place in the Saxons squad, alongside London Irish lock Nick Kennedy and Northampton's 20-year-old Courtney Lawes. "Selection for the two squads has been very difficult because there is a greater strength in depth of players to choose from now than we had 12 months ago," said Johnson. "The England players on the British & Irish Lions tour have played exceptionally well and this has allowed us to look at other players in the two matches against Argentina and in the Churchill Cup. "There is strong competition for places within both of the squads but there will also be opportunities, as there were last year for movement between the Seniors and the Saxons and for players to come in from outside the 64 because of injury, retirement or suspension. Delon Armitage and Mark Cueto are good examples of the latter and Ugo Monye and Joe Worsley have earned Lions caps after being originally selected in the Saxons. "Our selections include players based in France and Rob Andrew and I have had extensive discussions with the French clubs, who have recruited English players and these have gone well. We are looking forward to continuing the positive working relationship with them, which worked so well last season. "We will continue to monitor the form and fitness of the following players who were involved with England last season with a view to inviting them to training sessions as appropriate; Andy Goode, James Haskell, Tom May, Jamie Noon, Tom Palmer and Steve Thompson." Forwards: S Armitage (London Irish), S Borthwick (Saracens), G Chuter (Leicester), J Crane (Leicester), T Croft (Leicester), L Deacon (Leicester), N Easter (Harlequins), D Hartley (Northampton), B Kay (Leicester), L Mears (Bath), T Payne (Wasps), T Rees (Wasps), S Shaw (Wasps), A Sheridan (Sale), P Vickery (Wasps), J White (Leicester), D Wilson (Bath), J Worsley (Wasps). Backs: D Armitage (London Irish), M Banahan (Bath), D Care (Harlequins), M Cueto (Sale), H Ellis (Leicester), T Flood (Leicester), R Flutey (Brive), D Hipkiss (Leicester), P Hodgson (London Irish), U Monye (Harlequins), O Morgan (Gloucester), M Tait (Sale), M Tindall (Gloucester), J Wilkinson (Toulon). Forwards: R Blaze (Leicester), D Cole (Leicester), A Corbisiero (London Irish), N Kennedy (London Irish), C Lawes (Northampton), M Mullan(Worcester), T Mercey (Saracens), L Moody (Leicester), L Narraway (Gloucester), D Paice (London Irish), C Robshaw(Harlequins), W Skinner (Harlequins), G Skivington (Wasps), D Ward-Smith (Wasps), R Webber (Wasps), N Wood (Gloucester), B Woods (Leicester). Backs: N Abendanon (Bath), B Barritt (Saracens), D Cipriani (Wasps), B Foden (Northampton), S Geraghty (Northampton), T Ojo (London Irish), S Myler, (Northampton), P Sackey (Wasps), J Simpson (Wasps), D Strettle (Harlequins), J Turner-Hall (Harlequins), S Vesty (Leicester), D Waldouck (Wasps), R Wigglesworth (Sale), M Young (Newcastle).